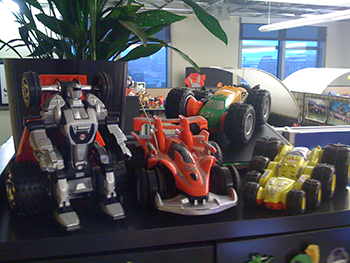 Handell manufactures and sells several lines of toy cars throughout Mexico. In 2008, they asked our in-house group at Cartoon Network to create ideas for a commercial to launch a new line of large, radio controlled (R/C) cars known as Handell RUSH XRC. They wanted to target the holiday buying season. The spot was so successful, that Handell's sales grew 130% after the commercial aired across several channels in the region.